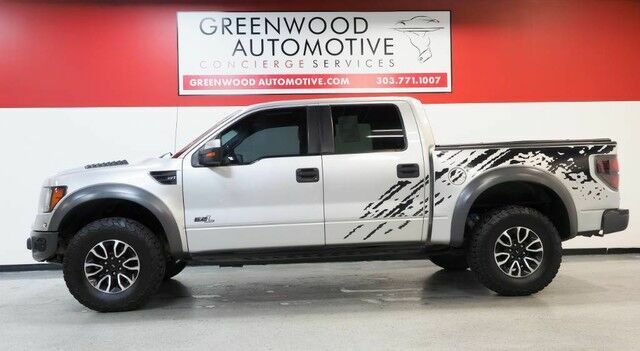 Greenwood Automotive has a wide selection of exceptional pre-owned vehicles to choose from, including this 2011 Ford F-150. The Ford F-150 SVT Raptor's pristine good looks were combined with the Ford high standard of excellence in order to make this a unique find. With 4WD, you can take this 2011 Ford F-150 to places roads don't go. It's all about the adventure and getting the most enjoyment out of your new ride. The incredibly low mileage and painstaking upkeep on this Ford F-150 makes it a once-in-a-lifetime deal that won't last long! Call us today to reserve your test drive! Adjectives like impeccable, spotless, and immaculate can be used to describe how clean this Ford F-150 SVT Raptor is, causing it to feel more like a new vehicle than a pre-owned one. More information about the 2011 Ford F-150: Ford claims class-leading fuel economy, as well as best-in-class towing and horsepower for both its base V6 engine as well as both of the available V8s. Ford also says that it's the only automaker to offer a 6-speed automatic transmission across its entire model lineup. The F-150 is also the only full-size pickup so far to offer electric power steering, which saves fuel and gives an improved steering feel. Across the lineup, the F-150 carries through with the full redesign that the truck received for 2009; since then, the F-150's very purposeful, upright instrument panel and vastly upgraded interior materials have stood out in this very competitive class. Strengths of this model include wide range of models for all budgets, tastes, and needs, available luxury features, Smooth, strong new powertrain lineup, class-leading towing and payload capacities, and fuel efficiency WWW.GREENWOODAUTOMOTIVE.COM for all Photos Our Dealer Handling fee of $499 is included in our advertised price. Government fee's and licensing are additional costs. For best service and to check availability or to set an appointment to see and drive call Steve direct at 720-339-1516 or Marc at 303-552-7909 For more information. FINANCING AVAILABLE. TRADES WELCOME. *VEHICLE IS FULLY INSPECTED BY OUR MECHANIC. We are located 4 Blocks West of I-25 on North side Of Arapahoe, Behind US Bank at Syracuse St.